I made this wreath for our front door, it was just so sad after the Christmas wreath was put away. I had the styrofoam wreath waiting for a project idea, and the white yarn. The thing that took the most time was the wrapping of the yarn. Fire up Netflix and watch a show or two. I cut out the triangles, added some gold stickers I had gotten on clearance a few months ago, and used some black and white bakers twine to tie it all together. 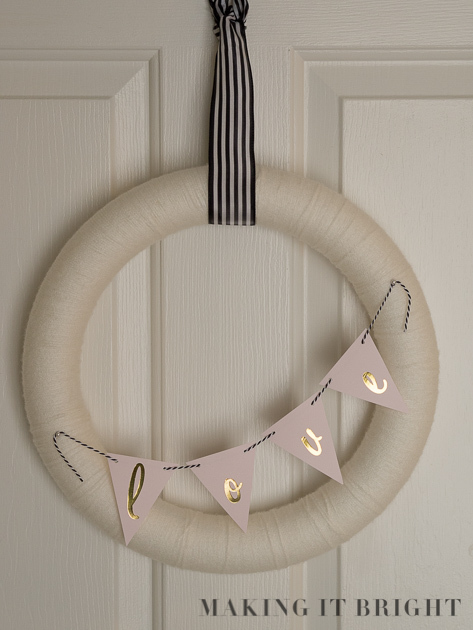 The LOVE banner is just stuck on the wreath with pins so I can remove it and use the yarn-wrapped wreath for another occasion (with some sparkly silver snowflakes next January? ).